The intersection of Burrard and Pacific is currently pretty bad for everyone walking, cycling and driving. It has one of the highest number of motor vehicle crashes in Vancouver due mainly to the right turn lane from Pacific to the Bridge. It is pretty dicey for cycling as well. Drivers often block the bike crossing while they are waiting to merge onto the bridge forcing cyclists to either wait or dodge them. 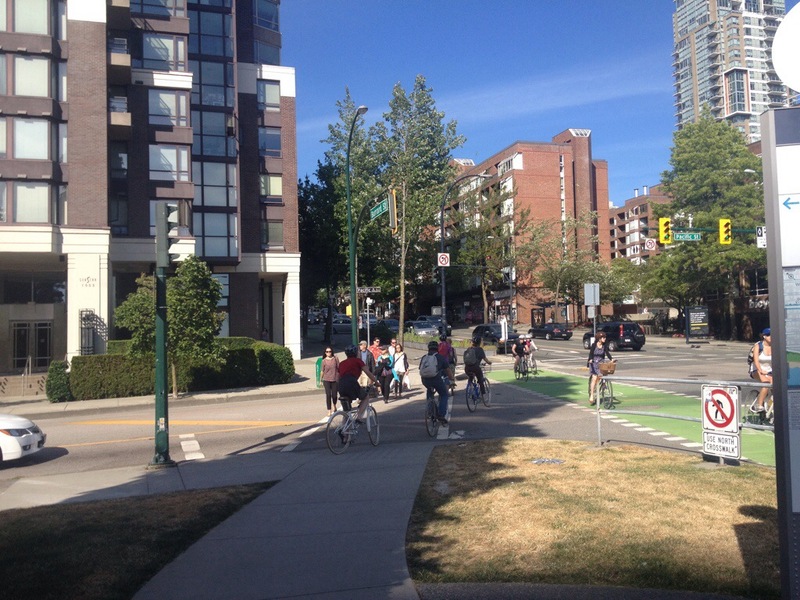 Assuming the proposed changes are approved by Council, Burrard and Pacific will join Burrard and Cornwall as one of the best intersections in North America for cycling. People cycling and walking will be protected from turning vehicles by separate signal phases greatly reducing the chances of crashes. It will also be great to be allowed to walk on the East Side of the Bridge again! 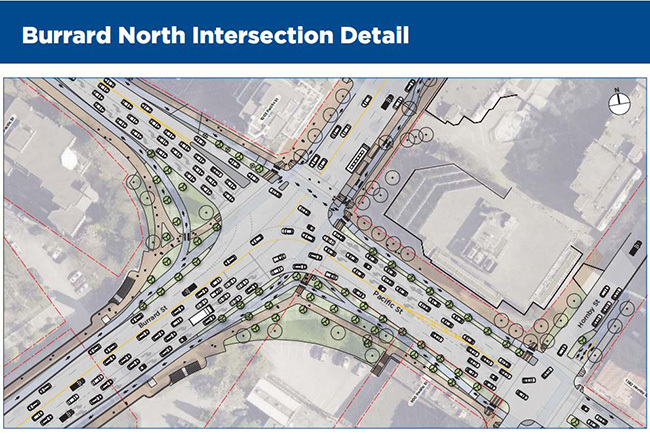 However, the proposed plan is missing an all ages and abilities cycling connection eastbound along Pacific across Burrard. This connection is needed to provide basic access to businesses and residences in the area. With two right turn lanes heading onto the Bridge from Pacific, riding on the road with traffic will be even a dicier proposition than it is today. As well, the grade on Beach and Pacific is much less than the grades on Thurlow (14%) and Hornby (10%) thus Beach and Pacific is naturally a better cycling route than the other options to access downtown via Burrard and Hornby. This is likely why it was included in the City’s 1999 Bicycle Plan. Without eastbound access across Burrard, there is really no reasonable bicycle access to downtown from residences and business in the area bounded by Harwood, the west side of Burrard, Thurlow, and the north side of Pacific. Without this access across Burrard, the only options for all but the bravest are to cycle to Bute then up to the alley that connects to Drake or to cycle to Thurlow then down to Beach or the Seaside Greenway then back up Hornby. As confusing as it sounds. Either option is several hundred metres long and requires crossing more intersections taking more time and exposing people to greater risk of a collision. Even worse, should a visitor or wayward local find their way to the southeast side of the intersection, as all the bike lanes are one-way leading to that side of the intersection, with no eastbound access across Pacific, the only allowed option is to cycle over the Bridge then cycle back across the Bridge. As this is pretty unreasonable, the result will be people not cycling, riding on the sidewalk, cycling in crosswalks or riding the wrong way in one-way bike lanes. Not safe for people cycling or walking. 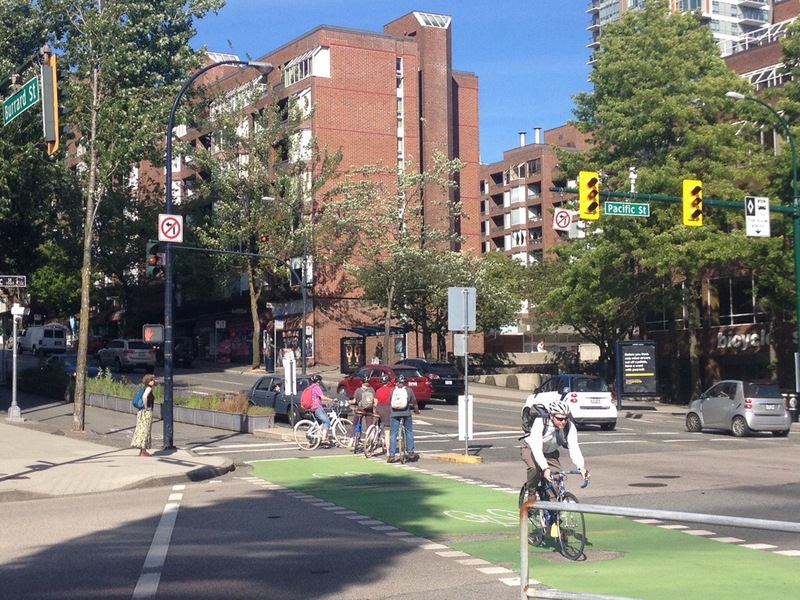 With Burrard Bridge and cycling in general proving popular with visitors to Vancouver, bike routes need to be obvious. I have witnessed many a tourist, some with maps open, at the north and south ends of the bridge wondering how to get anywhere. In the following photos, four people, likely visitors, making their way across Pacific to get to the bicycle rental shop on Burrard. A sure sign that better access across Burrard is needed. As well, the goal is to attract new people to cycling. These people will be used to navigating around the city by car, foot and transit. If cycling connections are providing along the roads that they are used to, it will be much easier for them to find their way around the city by bike. The only other eastbound all ages cycling route across Burrard south of Comox is the Seaside Greenway. The section of the Greenway between Burrard Bridge and Hornby is rather problematic with the current levels of bicycle traffic. Providing people with a route to avoid the problem areas is a good idea that will likely reduce cycling and walking conflicts and injuries. There are a couple of possible solutions that would provide people with good bicycle access across Pacific. Sadly, one involves removing the large tree at the intersection. The other really worth considering is removing the eastbound traffic lane on Pacific across Burrard which could allow for enough space for the bike lane while sparing the tree. Unlike for people cycling, where there are two bicycle rental shops, there are no destinations where the eastbound lane Pacific from Thurlow to Hornby provides needed motor vehicle access. Traffic on eastbound Pacific is pretty low and so is eastbound traffic on Beach. Beach also doesn’t have the long traffic light at Burrard so at most times of the day, Beach might even be faster than using Pacific. Traffic from Thurlow would just cross Pacific and head to Beach. The hill up from Beach isn’t a problem for motor vehicles either. 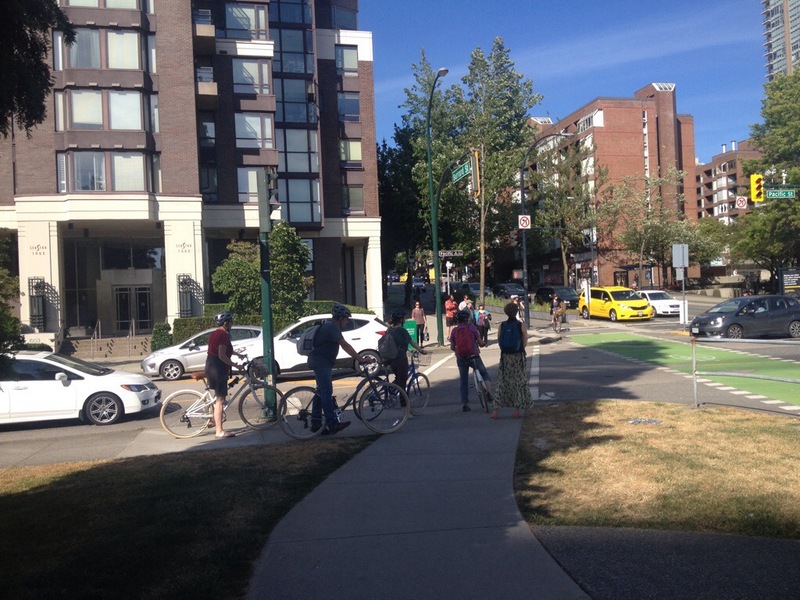 Please email Mayor and Council at Mayor Gregor Robertson and Council mayorandcouncil@vancouver.ca and copy the project team at BurrardBridgeNorth@vancouver.ca to encourage the City to provide this badly needing cycling access. Please join us for the next Bike Café where we will be discussing Car Free Streets in Vancouver. Many cities around the world have car-free streets or even whole areas with limited motor vehicle access. What streets in Vancouver are good candidates? 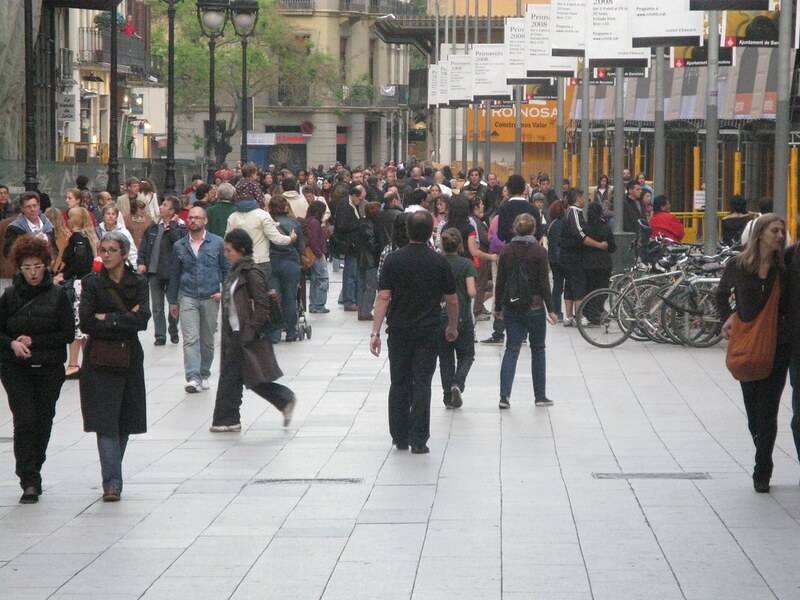 What measures are needed to ensure that car-free streets are successful? My gallery of great car free streets here. More info on the upcoming SFU Bike Cafés here. 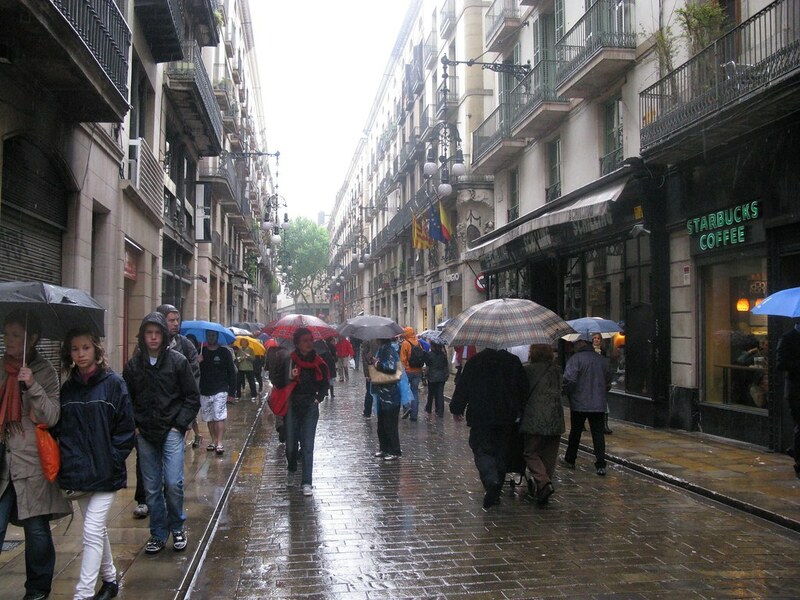 Car free streets are popular even in the rain! Price also notes that the preservation of single­family neighbourhoods is “classist. He says it’s the lower income families who are relegated to the townhouses on the main arterials, buffering the elitists residing behind them from noise and air pollution. Megahouses, vacant homes, speculation and affordability aren’t just issues for Vancouver. Reporter Graeme Wood in the Richmond News has been writing about the transformation of Richmond. Here’s an excerpt. Car parking that is. More bike parking needed. Parking is certainly important for providing delivery and customer access to businesses. However concerns about losing parking spaces on Commercial Drive if a Complete Street is implemented are unwarranted. Slow Streets conducted a parking inventory finding that there are over 700 public parking stalls surrounding Commercial Drive (between Grandview Highway and 1st Avenue). 87% of parking stalls are located off Commercial Drive and are available to the public for free, with the remaining 13% being paid meters. 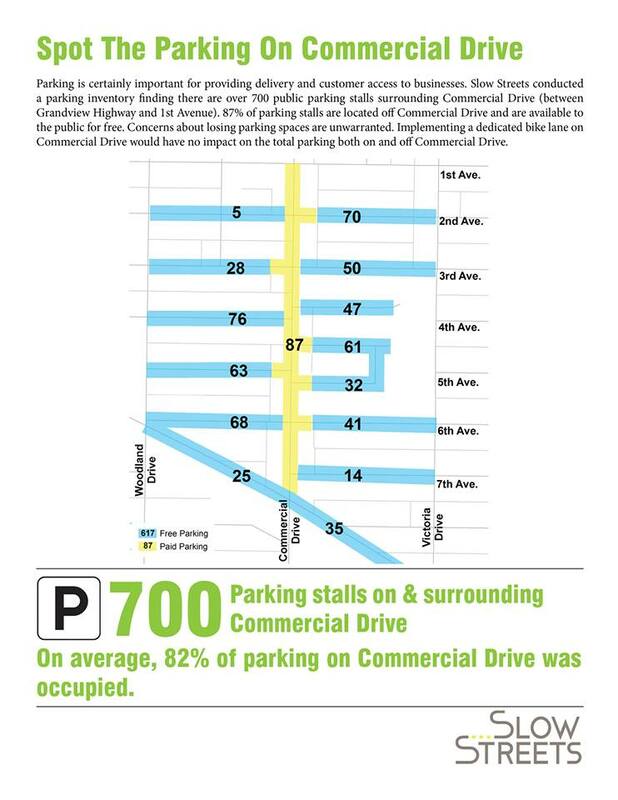 Implementing a Complete Street on Commercial Drive would have no impact on the total parking both on and off Commercial Drive. What does this mean for Commercial Drive? Slow Streets will be releasing a report on January 19th with full details. I’m very pleased to be moderating the first Bike Café! Please join us. Currently, cycling levels fall significantly when in it rains. What measures, policies and infrastructure will encourage more all weather cycling? The new Bike Cafés take place along major commuter cycling routes at cyclist friendly coffee bars. This new series engages with Vancouver’s cycling community and others interested in discussions regarding the sustainable evolution of our cityscape. In collaboration with the SFU City Program. More info on other Bike Cafés here.